The other morning when I was out in the garden trimming back the tomatoes and trying to get the green ones off the ground, I was thinking back to a conversation that I had with my Aunt E- some years ago regarding an incident that had happened in her childhood. It seems that when she was around the age of eleven or so, she was sent off to live with a far-off aunt and uncle for a year, without any say-so on her part. Her mother's sister had just had her second baby and needed some help, and so my aunt's mother packed her off and sent her away. This horrified me, and must have had a deep impact on my aunt in order for her to recall it and still speak of it some fifty years later. "What must you have thought?" I asked. "Well I didn't think anything," she told me pointedly. "It was just how things were done then." But she admitted that often, alone in her room, she would cry sometimes. My mind wandered. You could best believe I would have had many thoughts had it been me. Like, why me? And don't my parent's love me? And are they ever coming back for me? It got me thinking about how, in our family and in all families, there exists a culture of how things are done. And you don't question how things are done because as part of the family you just know these things and go along with them without question, and these things are impossible to explain to other people outside your family. I was never more aware of this when as a new bride, I was able to both observe the family culture of my in-laws, and found myself having to explain or make excuses for how things are done in my own family. For me, it was deeply interesting to observe how in my husband's family, words serve only one purpose: to exchange information. You would never catch my husband's family talking about feelings, making compliments, and certainly not expressing any form of vanity. You can talk about the weather, small engine repair, or what neighbor died, but you won't ask something like "How does that make you feel?" Chances are, it hasn't occurred to anyone to think about something as so besides the point like how they might feel. All I can say on that front, is thank you Lord for giving us sister-in-laws, who love to latch on and share the meaningful stuff after everyone else has gone home from the picnic! "Have you thought about what type of cake you are having?" someone will ask. "No, not really. Maybe an ice cream cake like last year." "Do you remember the cake you had with the raspberries? G--- really liked it." Me having no memory of this cake (probably because it was just okay but not really great), can realize that it is a ploy to have some sort of fruity cake on my birthday, which is the last thing I want. But the negotiations are just beginning. And why does everything is this family end up being about food, anyway? Must be our culture. By the way, my poor Aunt E- who was sent away? She always makes this fruit pudding when we visit. I made it here with fresh cherries, but you can use any fruit. Blend the first five ingredients together with a pastry cutter or your fingers to make a crumb consistency, then add milk and vanilla. Stir this mixture with a fork until a soft dough is formed. In a pot, boil together the remaining ingredients. If you are using canned fruit, skip the full amount of sugar. Pour the mixture in an 8x8 pan. Spread the dough on top. Bake at 350 for 50 minutes to an hour. Serve warm with milk or ice cream. I wish you could smell it. You just know that smelling capabilities will be one of the features of Web 4.0 some day. 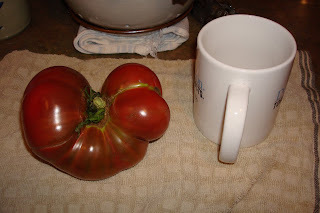 In the Garden: This enormous Brandywine tomato almost scared me when I saw it hanging on a low vine. This one tomato, cut up, made a large serving of fresh salsa. Oh Monica yummy! I must ask does this need to be in the fridge after it cooks? Just wondering if I could sell it at my stand..The whoopies pies are such a big hit. Just love the choc ones. Thanks and that tomatoe sure does look good since I don't have any.. The Cherry Pudding looks delicious! I saw it was your Birthday hope you have a blessed one! Happy Birthday!! I came by to wish you a Happy Birthday, and now...I found a great blog and recipe. Hope your day is wonderful. Just reread this post again... Knowing you, I just had to sit with it awhile, absorbing all it said and didn't say (which was there as much as what wasn't said - just like how you described the situation in your in-laws' family). Objectively speaking though, lovely writing style - what you said, what you didn't, how it led to the familial differences, ending with food - the lovely "pudding" (which is the furthest thing from what I think of when I use the word "pudding"). Well, just beautiful. And heartfelt, as always. Thanks, Linda. This post brought back some memories. A year or so later a friend mentioned cherry pudding and she made it the same way. 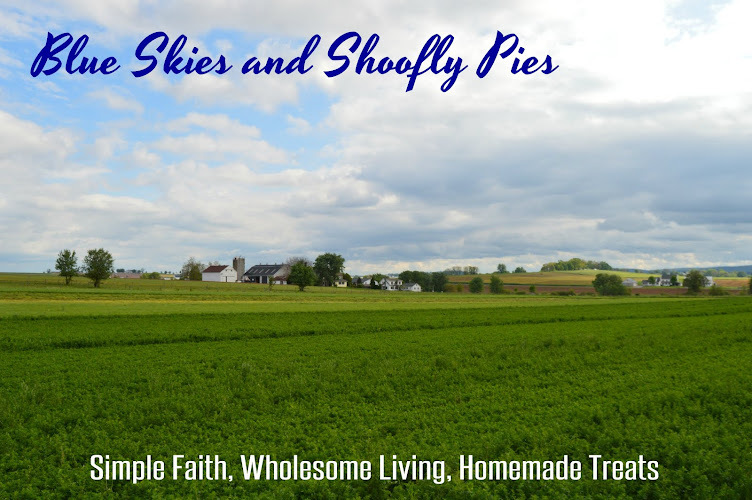 It's a traditional Amish pudding, and believe it or not, popular for breakfast! Oh, I believe it! Haha! I know the British use the word "pudding" to mean just about any kind of dessert. Their "puddings" are often steamed. I only use "pudding" for things that end up looking like Bill Cosby's Jello "pudding". Haha! And I would love eating that cherry beauty for breakfast! In our family, we'd call that a "cobbler". My grandma and my mister's grandma both gave me different recipes for something just about like this. The mister's grandma called hers "Cherry Pike". My grandma's was labeled "Cherry Cobbler". Both grandmas recommended topping the dish off with ice cream!